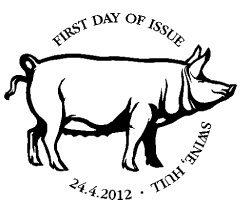 Pictorial Faststamps: Pigs - 24 April 2012 - from Norvic Philatelics. 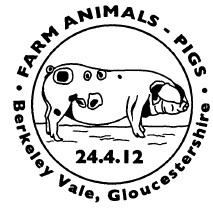 Royal Mail continues its venture to the farm in 2012 with the second in a new series of Post and Go stamps. 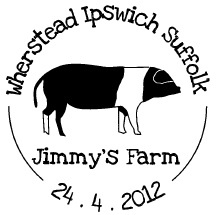 This isssue shows some of the many traditional breeds of pigs to be found on farms in the UK. Post & Go terminals allow customers to weigh their letters and packets, pay for and print postage labels and stamps without the need to visit the counter. The first Post & Go machine was trialled in The Galleries Post Office® in Bristol in 2008. The labels can be obtained with 6 different service indicators: 1st class up to 100g & 1st class Large up to 100g, Europe up to 20g, Worldwide up to 10g, 20g, and 40g. The stamps are dispensed singly or in strips of up to 5 of the same value or various values. Thus there are 36 different value/design combinations in total. All images are copyright Royal Mail. Rare Breed Organisations and others wishing to use images on websites or in magazines should contact Royal Mail's Intellectual Property Department. Berkshire pigs are said to be ‘Britain’s oldest pig breed’, originally bred around the market-towns of Faringdon and Wantage, in the Vale of the White Horse, which prior to the 1974 county boundary changes was in Berkshire. The pigs are believed to have become popular in other parts of England after being discovered by Cromwell’s troops while they were stationed at Reading during the English Civil War. Today’s animals descend from the herd maintained by the British monarchs since the early 18th century. Berkshires are early-maturing pigs well covered with short black hair, often with white hair on their legs, faces, and tips of the tails. The snouts are dished and of medium length. The ears are fairly large and are erect or slightly leaned forward. They have fine wrinkle-free necks and well-sloped shoulder blades. They have short, straight legs and a straight underline belly. The Oxford Sandy and Black pig sometimes referred-to as the ‘Plum Pudding or Oxford Forest pig’ is one of the oldest British pig breeds, and it has existed for 200-300 years. It is a traditional farmers and cottagers pig, of the middle part of the country, especially around Oxfordshire. It seems to be closely linked to the old Berkshire and Tamworth. The breed has many good qualities, particularly its excellent temperament and mothering abilities. Prolific and hardy it is particularly suited to outdoor systems, being good foragers and as they are a coloured pig with a good coat they are far less prone to sunburn. The ground colour should be a light sandy to rust with random black blotches (not spots) with a white blaze, feet and tassel. The Gloucestershire Old Spots is a large meaty animal with a broad and deep body and large hams. Its white coat has large clearly defined black spots. A few years ago fashion called for only one or two spots but today breeders have decided that if you are going to have a spotted pig, then it should have more spots. The spots should, however, be clearly defined and black but not blue. Their legs and feet should be strong and straight and their ears should be lop ears covering their faces and coming down to their noses. 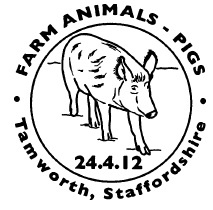 Today’s Tamworth is thought to be themost typical breed descended from the old indigenous species, the Old English Forest pig. It has maintained this status because at the end of the 18th century, when many native breeds were ‘improved’ by crossing them with Chinese and Neapolitan stock, the Tamworth was not deemed fashionable and hence left alone. It is now therefore the oldest pure English breed and, as a result, it is also sometimes crossed with wild boar to produce distinctive gamey pork. The Welsh pig is white with lop ears meeting at the tips just short of the pig’s nose. It has a long level body with deep strong hams and legs set well apart. George Eglington acknowledged as the founder of the modern Welsh breed described the perfect Welsh pig as ‘pear shaped’ when viewed from either the side or from above. They are still known for their hardiness and ability to thrive under a wide variety of conditions, both indoor and outside. The British Saddleback is the result of the amalgamation of two similar breeds, the Essex and Wessex Saddleback. Lord Western, while travelling in Italy, decided that Neapolitan pigs were just what he needed to improve the Essex pig. He crossed Neapolitans with Essex sows. 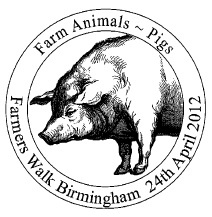 His tenant Fisher Hobbs crossed Western’s Neapolitan-Essex boars with his own coarse Essex sows and established the Improved Essex. This pig had a black head and neck, as well as a clearly defined belt of white extending over the shoulders and continuing over the forelegs. The rest of the body was black with the exception of white feet and the tip of the tail. The Wessex originated in the New Forest as a cross between two indigenous old English bacon pigs. By 1914 the breed was also found in the South and South West. It was black all over, asides from a continuous belt of white hair over the forelegs and shoulder. The respective breed societies amalgamated in 1918 and the herd books followed suit in 1967 when the British Saddleback breed was established. Designed by Kate Stephens and illustrated by Robert Gillmor the six 56mm x 25mm stamps are printed in gravure by Walsall Security Printers, with two phosphor bars. The stamps in the pack will have the service indicator and other detail printed in gravure. 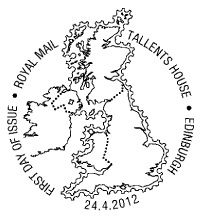 All images are by kind permission of Royal Mail, Copyright 2012. This website is copyright Norvic Philatelics 20121. The labels will be used in Wincor-Nixdorf Post & Go machines at Post Offices around the country. A mint set of 6 x 1st, produced on Hytech machines, will also be available from Royal Mail's Tallents House Bureau in a pack on an attractive card with details about each of the breeds. The set of 36 will not be available from Hytech machines until Autumn Stampex (26 September). 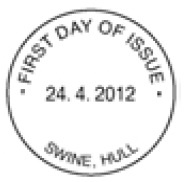 Postmarks available for the day of issue will be shown here - others may be added later. These are not to scale. These postmarks cannot be obtained after the date of issue.